December 2, 1980. The segment within the Kobuk Valley National Park. Wild — 70.0 miles; Total — 70.0 miles. Located within Kobuk Valley National Park, the Salmon River is small but exceptionally beautiful, with deep, blue-green pools and many rock outcroppings. Vegetation ranges from alpine tundra to treeless bogs. The Salmon River flows 70 miles from the limestone cirques of the highest peak in Kobuk Valley National Park, Mt. Angayukaqsraq, to the Kobuk River. The Salmon River supports an excellent grayling fishery and large runs of chum and pink salmon; the river owes its name to the large salmon runs. 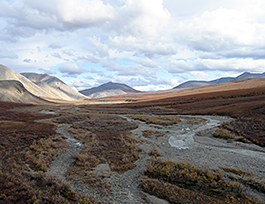 Over its course, the Salmon River flows through the ecotone where arctic tundra transitions into boreal forest lowlands. In the mountainous headwaters, the river rushes and tumbles through a narrow steep-sided valley, often with bare rock walls on either side. In the middle reach, the river slows and forms numerous inter-connected deep pools as it flows through rolling hills. Water of exceptional clarity, coupled with blue-green gravel found in the area, give the pools exceptional color. In the lowlands, the water slows, flowing through low-growing spruce forests and treeless bogs until joining the Kobuk River.